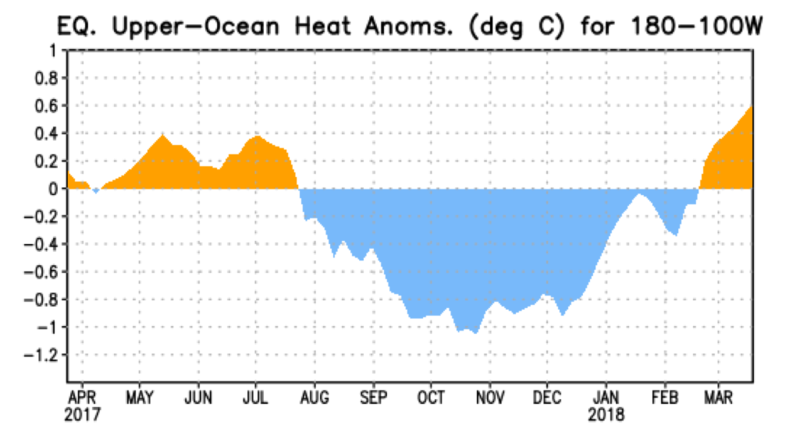 It has become increasingly clear that our current La Nina is doomed and that next winter we will probably be in a Neutral or "La Nada" situation. Maybe even a weak El Nino. As you will remember, La Ninas are associated with cooler than normal sea surface temperatures in the central and eastern tropical Pacific. Here are the temperatures for the Nina 3.4 area that meteorologists love to use as a key marker of La Nina/El Nino activity. Blue indicates colder than normal. Still in a La Nina. La Nina's are generally associated with high pressure out in the eastern Pacific and cool/wet conditions over the Northwest, particularly after the new year. And we have had that situation in spades the last month. Here are the anomalies (differences from normal) for the heights (like pressure) at 500 hPa (around 18,000 ft) for the past month. A trough over us (blue colors) and a ridge (red colors) south of the Aleutians. This pattern is why we have had so much snow the last month or so, since the cool, wet trough is favorable for mountain snows in our area. But things are changing. The cold water in the Pacific is being eroded from below as warmer water moves in. This figure shows the heat anomaly (difference from normal) under the surface at the equator. It is now warmer than normal beneath the surface. The grim reaper for La Ninas is preparing the final end. The Climate Prediction Center even gives probabilities for the upcoming months. 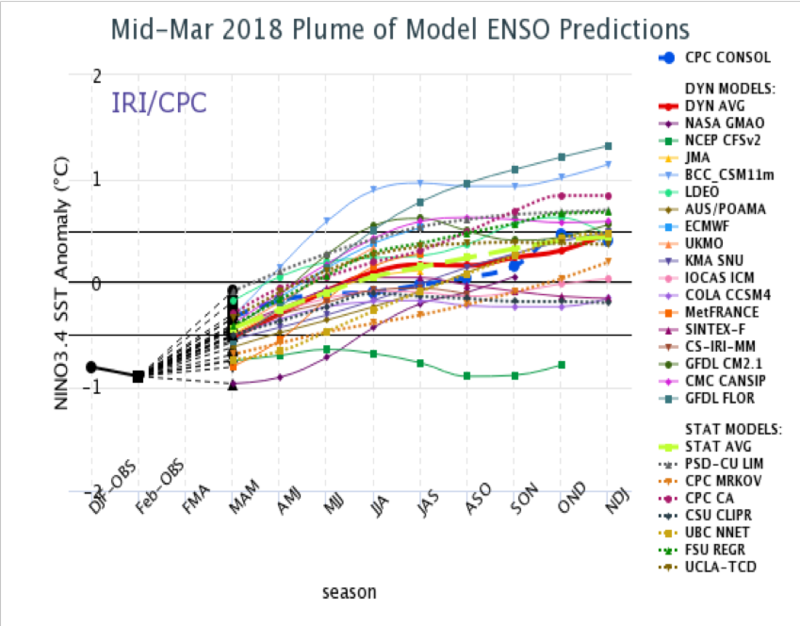 They suggest we will rapidly go into Neutral territory by late spring and stay there into early next winter, with a nearly equal chance of being in a weak El Nino. 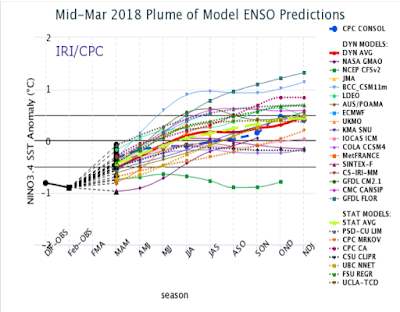 skymet has released SWM 2018 forecast (early analysis). Needs to be seen how much this holds true? Disappointing for southern India - below normal / less rains. If this happens 3rd successive drought year. MAHA,GUJ,RAJ - excess / normal rains. MAHA seems to be getting wetter every passing year. GUJ/ RAJ good rains! Quite windy and bit cold in navi mumbai! Lol. Someone feeling cold in hot summer !! Now after hyped waterfall like rain now cold summer new terminology ! Thane mahavedh max 39.8, Rabale imd 38.2 & Turbhe mahavedh max 37.7c today.